Black Flag, Anobium: Volume 2 Release Party, Record Players that Play Wood, Sentences With The First Letter of Almost Every Word Capitalized, Sentence Fragments, and so on. You get the idea. This is the second installment of our friday Ennealogical Series, where we list some of the coolest things we’ve found over the week. There’s nothing magical to comprehend. It’s all very apparent. 1. SSTvinyls.com – So maybe it’s not in totally high demand, but someone is giving it and someone else is taking it. SST Records, which was formed by Greg Ginn at the end of the 1970’s, was a record label that put out some great and not-so-great music, much of which has been forevever relegated to the realms of obscurity. This website is doing the god-powered deed of cataloging all of it, and making it more readily available. Props. 2. The Anobium: Volume 2 Release Party – February 4th, just a little over a week away. Chicago, north side, off the Irving Park Brown Line stop. Cheap. BYOB. People reading, music playing, books selling, elbows rubbed. Simple enough. RSVP whydontchya? 3. 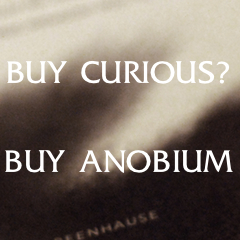 Anobium: Volume 2 Itself – Just a few more days where the pre-release discount is still good. Order a copy so you know what we want, what we really, really want. It has writing from Jesse Ball, Patrick Somerville, Blaster Al Ackerman, Jonathan Greenhause, and a dozen others. It’s in an easy-to-swallow capsule. 4. Imaad Wasif – So maybe we’re a few years late on his last record, but better late than never, right? 5. Daniel Higgs, ‘Beyond & Between’ – Speaking of music, Dischord Records finally got ahold of the December La Castanya release from Mr. Higgs. We got the record this week, and the Anobium review is positive and forthcoming. You’ll see it ASAP. 7. Aborted Fetuses Banned From Oklahoman Food Products – While there are many more important issues floating around in the air, Oklahoma Senator Ralph Shortey can, at the very least, be congratulated for being transparent. 8. A Record Player That Plays Wood – Possibly not the first to have thought of it, but definitely the first to implement it, this German artist takes planes of wood and turns their rings into music. 9. This Book – Conspiracy theories, researched evidence, glossy, high-color printing. Top shelf.